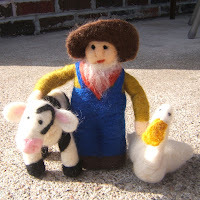 As a follow up to yesterday's post about Clover the needle felted cow, I give you Farmer Brown. 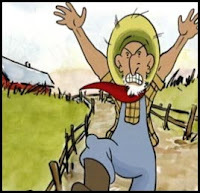 Also modelled after the 'Click Clack Moo' books, Farmer Brown stands about 5" tall and has arms that are poseable. He has no frame or wires and his fishstick shape enables him to stand sturdily and freely for toddler play. He is 100% wool (Corriedale and Merino).